EditShare announced the availability of Flow v3.1, the company’s comprehensive media asset management solution. Management of Metadata Created in Avid: New sub-clips, markers, comments and associated metadata created in Avid non-linear editors can be imported into Flow, making the sub-clips “searchable log entries” within the Flow database. 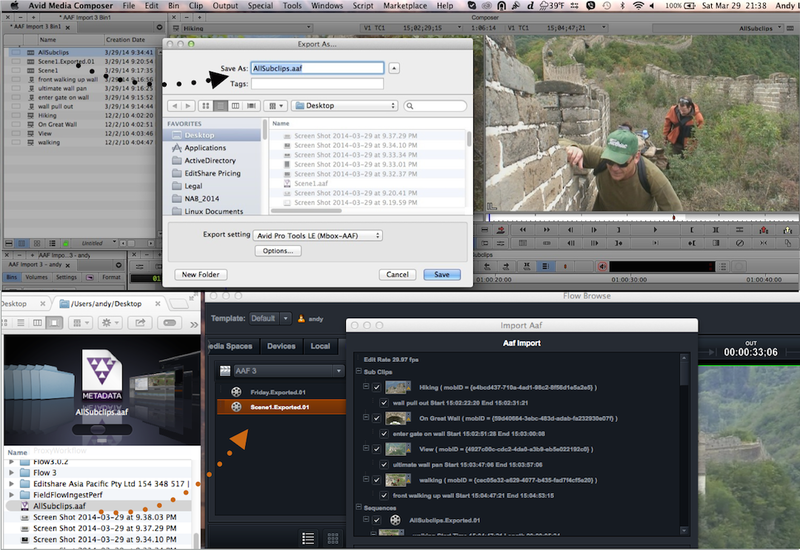 With AAF import, Flow now provides a complete round-trip metadata workflow for Avid editors. Individual File Restoration: Flow users can easily restore archived clips based on AAF file metadata. This feature is particularly useful if an Avid editor wants to work on a sequence where certain clips have been archived. The editor imports the sequence (via AAF file) to Flow; Flow then locates all of the referenced clips, simplifying the search and restoration of media. Create an Instant Proxy Version of Your Sequence: Sequences can be cut in Avid and then imported into Flow (via AAF), where a simple cuts-only sequence will match up with the existing proxy files. The proxy version of the Avid NLE sequence is available immediately for playback in the Flow Browse standalone client, or in AirFlow. EditShare’s AirFlow application for accessing Flow assets over the Internet via a standard web browser has been updated to improve the creation and playback of sequences and to provide powerful new filtering tools to help sort through searches and find your media faster. The new Flow “extension” panel puts the power of Flow Browse right inside the Adobe Premiere Pro CC application, providing dramatic improvements in convenience and productivity. Without ever leaving Premiere Pro, users can search and browse Flow assets, update metadata in the Flow database, and import desired clips into their Premiere Pro Project. Adobe Premiere Pro, Avid Media Composer, Apple Final Cut Pro and other industry-standard NLEs can leverage Flow H.264 proxy files for editing. With improved metadata tracking, users can download Flow proxies through Flow or AirFlow, edit with the proxies, and then relink their NLE sequence to high-resolution files on EditShare Media Spaces, dramatically expanding workflow possibilities for large workgroups and remote collaboration.